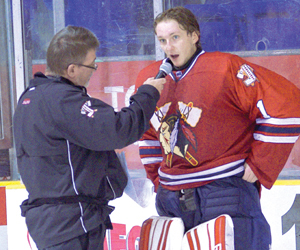 There is no way to get closer to the action than by putting your company logo right at the center of attention with patches or stickers on the team’s helmets, warm-up uniforms, practice jerseys, team jackets, or any of the Tomahawks three game jerseys. Your support of the team is sure to be noticed at games, player appearances, or any printed materials featuring photos of the Tomahawks in action. Chopper, the Tomahawk’s lovable red mascot, is a hit with fans of all ages. 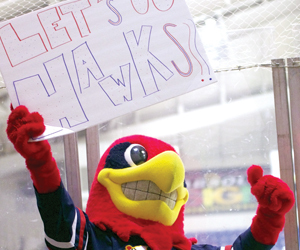 Be part of the fun by sponsoring a special patch on Chopper’s jersey, or put your company’s logo on the many signs and cheer cards he carries throughout the arena to get fans pumped up during the games. 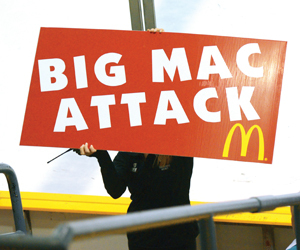 Gain great brand recognition by sponsoring a segment of every home game. Hear your company’s name announced every time the starting line-ups are introduced, during scheduled time-outs for ice maintenance, or each time the Tomahawks go on the power play or penalty kill. You can even sponsor the team’s official game pucks and hear your name announced each time a puck leaves the playing area. Create your own special promotion for Tomahawks fans, such as exciting giveaways or discounts whenever the team achieves a specific goal. Or, for maximum exposure, sponsor a special promotion to keep fans entertained at intermission or during breaks in game play. 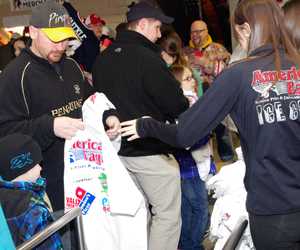 Among the most high-profile ways to make an impression with Tomahawks fans, sponsored giveaway items can be distributed to fans upon entering or exiting the arena. Giveaway items pairing the Tomahawks logo with your own keep your company in mind long after the game is over, and giveaway sponsors can gain additional promotion through print, online, and television advertising!